iDevice Manager can you look into the file system of your iPhone, iPad and iPod Touch and download / upload files by USB connection, regardless of the file format. Within this function you can use your iPhone/iPad/iPod as an "external disk". The program supports direct access to photos, emails, SMS, and video directories of the iPhone. View photos, emails, SMS, videos and all other files easily. The same function is also available for videos, music (from iPod-App) and ringtones. 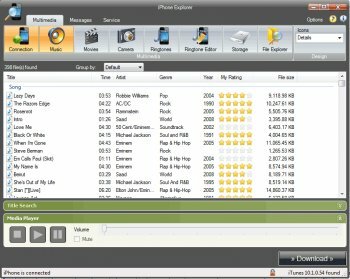 The highlight is the creation of your own ringtones with the ringtone editor from MP3, WAV, AIFF and M4A audio file formats. Fails to install on Win 10 - insists on trying to install a bunch of C++ stuff that's already in Win10 and fails with an error message. This has been true for all versions above 7. Company notified months ago, no fix in site. This is the only program I've ever been able to find that has been able to actually save my MP3 collection that existed solely on my iPod Touch, back to my hard drive. I had copied all of my songs to my iPod, and almost immediately had a disk failure that lost the whole collection. For that, I am super grateful. However, I now have a few dozen mp3 files that are named with 4-letter filenames that have no relation whatsoever to their original content, and the free edition of the software has a "10 per day" download music limitation it tells me now. Had they not had that limitation, I would've used this software and given them $50 for it.. but now i'm going to somewhat angrily give them the $2 they ask. At least the MP3 file tags are still present, so I can probably get MediaMonkey or something to rename them all. I wanted very much to try this but my virus scanner (ESET Smart Security) was screaming at me, it said: IDMSetup.exe » NSIS » biclient.exe - a variant of Win32/Somoto.A potentially unwanted application. Needless to say I didn't download it, shame looks like a good app. just spent an hour trying to restore my browsers. said no to ever prompt, and it still installed the toolbar on all 3 browsers. even when I cancelled the install the toolbar went ahead and put itself on. using uninstall didn't get rid of it either. even after running system restore my setting were changed etc etc etc. this is so depressing, I'm not a tech guy but avoid this once useful program that now is trying to so get up my skirt. no means no, why have the option to say no if it overrides it? Bottom Line: Fails to install on Win 10 - insists on trying to install a bunch of C++ stuff that's already in Win10 and fails with an error message. This has been true for all versions above 7. Company notified months ago, no fix in site. Apart from the fact that since 1.3.0.0 I'm unable to complete the installation due to an error, it looks like 1.3.2.0 FORCES you to install third part stuff. It gave you the choice in previous installers, now you get it and that's it. Hence bye bye. Work ok but would be nice if you were able to edit the file name. It seems that the dreaded iTunes DOES need to be installed. If I am wrong on this can someone tell me a work-around for this. After installation it does say iTunes is not detected please install (it). No I'm not. Probably not, even if there was, it would be equivalent to the IE for OSX which isn't typically compatible with IE on Windows.